I think I have grown out of 'crunchy'. When I was in college, that was all I wanted to be. As hip and crunchy as everyone around me (VERY liberal college)... but at the time I had a baby. So while my friends were dressing in all hemp, enjoy the occasional smoke, and staying up all night for parties, I was changing diapers, staying up late doing homework while my baby was asleep, and trying to keep my apartment warm on $7/hr. It was a different life. And I don't regret having my son for a second. Fast forward 12 years. And all of a sudden neither I nor Alex are little kids anymore. I am almost 32. He will be 14 this summer. I can do/get/make just about anything I want and he is turning into a man before my very eyes. I am so much more invested now in being real than in being crunchy or hip. I have tried to find balance in the things that I thought I would always stand firm. It isn't always easy, but it is always worth it. Not much of a point to this... just a deep thought of the moment. It could not have been easy. I cannot imagine going through college with a baby. The fact that you did so and clearly did it well, is something you can always be proud of. Val, what a lovely post. 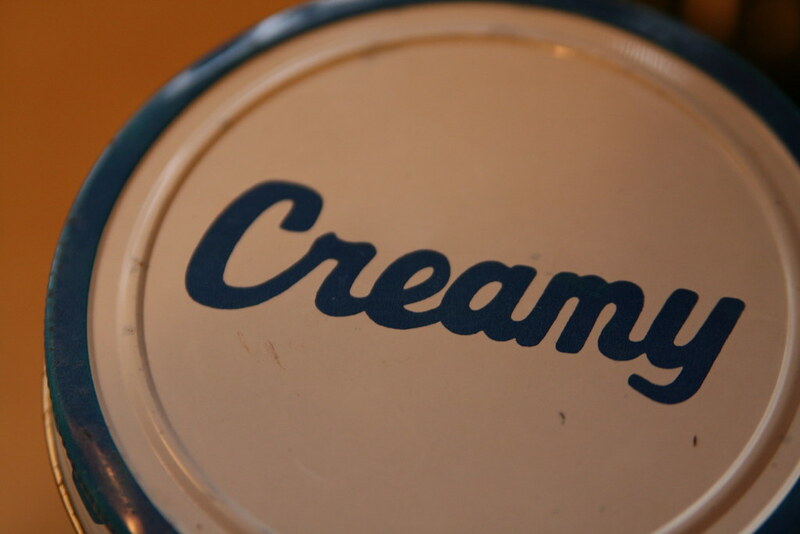 "Creamy" is perfect, and full of balance. I miss you guys!! I have found this to be true in my life as well. I am 28 and the older I get, the less I want to "be something." I don't feel like I have to define myself with labels like "crunchy." Maybe I am what someone might call crunchy, but I don't give a flip about calling myself such. I just do what I think is right, and I let it flow out from my existence. There is no try or try not, there is only do or do not, you know? Thank you guys. :) I don't think I have ever mentioned on here that I was a teen mom before. I find it strange that such a huge part of my life has been left behind, but it really has. After those first few years, most of the time I don't feel like a teen mom. Of course I still get the "you look WAY too young to have a teenager" and I kinda am... but I do, and I love him with all my heart. We made it work, he and I, for a long time. He was my frist love, and as hard as it is having a teen while so distinctly remembering being a teen myself, I still find myself falling in love with him every so often, and knowing that it was the perfect choice for me. Here, here! from another not-so-crunchy. I just am. I'm me. Though not a teenage mother, I had a family to help support starting at thirteen and then was on my own a couple years younger than most, so I've got an idea of what teenage mothers feel like. You are an inspiration Val. One of those people that people look to and think, "She did it, maybe I can to..."
And, though I don't know if you remember, you sent my sister things when she became pregnant at 17. She didn't know what to think of someone she didn't know sending her a box of wonderful baby goodness, no strings to lectures attached. My niece wore the tie-dye onesie (sent by you) home from the hospital and again each and every time it came out of the dryer until about 4-5 months old. :) I thought of your kindness and generosity each time I saw her in it. So teenage mom, crunchy or creamy, though I don't know you IRL, I think your kids have a wonderful example of humanity with you as a mom. Thanks for the note and the reminder. What a nice gift. I really like this post! Being "real" is the most important thing. I can relate to your feelings about this. Kudos to you for raising a child while working and going to college! Wow. Nice post, I appreciate the perspective! I was raised by a teen mom and she is my greatest inspiration! I'm 40 & she's 56, now. I like that. You should be proud of yourself – a great role model! Being real and true to yourself is more important than being "hip and trendy"